Tea. The bloggers favourite, eh. I hoard so much tea it’s unreal. My cupboard is akin to Ramona Flowers from Scott Pilgrim Vs The World when it comes to my tea collection. It’s very rare that I actually drink it though. It seems to be one of those things I keep buying for the exotic flavours, only to get bored of them after a week or so. Adagio Teas have changed the game though and I’m already nearly out of this fine Christmas selection. I mean, who knew tea could be this exciting? Move aside Gingerbread Green Tea. Most of the flavoured tea I have is green tea based, which is probably why I like the Adagio Teas more, as these are all black tea bases with a variety of flavour offerings. 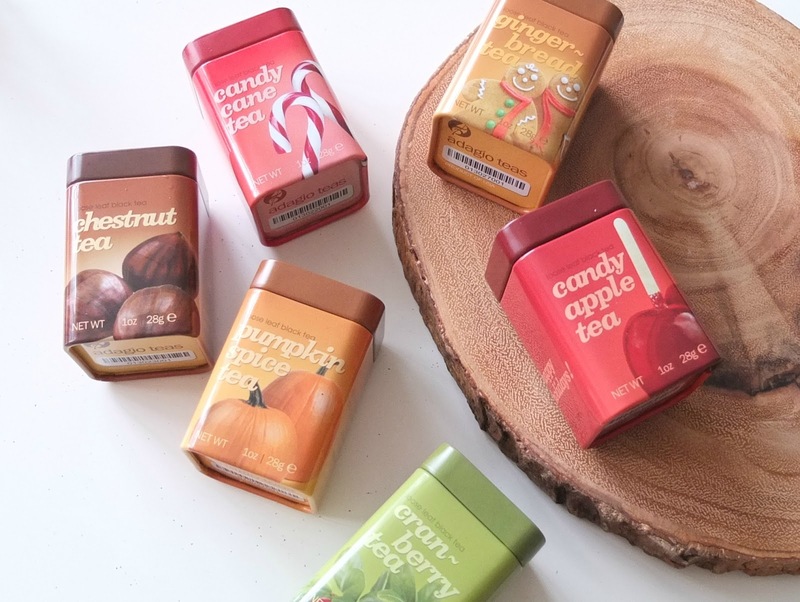 Coming in a little selection box, the Holiday Stocking Stuffers Tea Selection has a obvious Christmas theme to it. However, the flavours themselves can be enjoyed all year round. My favourite is the Cranberry Tea, which is a lovely fruity flavour and perfect for any time of the day. In the evening though I prefer the richer flavour of the Chestnut tea, which at first I thought would be really weird. The nutty flavour is just lovely though and it’s slightly sweet which is perfect for when you’re craving just a lil’ somethin’ somethin’ at night but don’t want to dip in the digestive biscuit tin. Other flavours in the selection are: Gingerbread, Candy Cane, Pumpkin Spice and Candy Apple. The only one I really don’t like is the Candy Apple as it seems to have a really artificial apple flavour to it, which I’ve never really liked. Apart from that though, they’re a deliciously different collection which holds so much more flavour than the standard ones on your supermarket shelf!